After happily using 1Password (stand alone including 1Password7) for many years I decided to migrate to the family plan and thus benefit from secure syncing via 1Password cloud. The migration went smoothly (I can see all my passwords in the browser). However, I now want to unlock my 1Password7 desktop app again but it refuses my password (on purpose I kept the password for the new family scheme and my existing master password for 1Password app the same). If I enter Preferences/Accounts I can see I'm subscribed but when I click on "subscribed" I get the message "Account Credentials Missing". What do I need to do? I have reinstalled 1Password7 several times by following the the instructions in my.1password.com. I also can't follow the instructions on How to add your 1Password account to the apps since the first step is to unlock 1Password. Hi @Erik1P! Welcome to the forum! Just to clarify: without sharing any account information here, what is the field behind the error message in the screenshot that is missing? Is it the email address or the Secret Key? And the first time you added your 1Password account to the app, were you able to do it without problems? At the moment I can only login to my vault via my.1password.com. I can't unlock the browser extension nor the 1Password menu bar item nor the 1Password desktop app. I did not encounter a problem converting 1Password on my wife's laptop (we used to share a vault via Dropbox). On her laptop I can open the 1Password desktop app, unlock the browser extension and login to my.1password.com. I see the same vaults/password items in all cases. 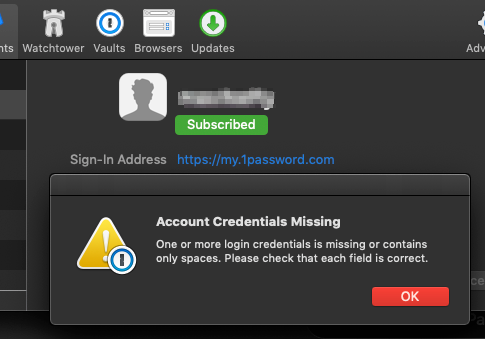 It's possible that something went wrong when you tried to add your 1Password account to this app. You said that you see all your items on 1Password.com, but does this 1Password app on the Mac contain other items that you don't see on the website? I ask this because, if there is nothing else that you need inside the desktop app, you could reset it and start over with a fresh app. This way, you can then add your 1Password account and see if you are able to add it without problems this time. It's difficult to check whether all items are included since the are not counted by category in my.1password.com. However, I can see the ballpark figure is correct (1,000+ items). And fortunately I exported all my items to a .1pif file before I started. So I suspect I will be covered. I also saw I can deauthorize a device in My Profile. Would that be of any help? If not, what is the correct way to remove and restart 1Password. Removing 1Password completely from my desktop using a tool like AppCleaner or AppZapper? I am honestly not sure: it's the first time I see this error message. But in this case, I think that the app itself might be the problem, rather than the account, so it's possible that just deauthorizing your account won't fix the issue if it indeed lies within the app. Please email this report to [email protected] Once you have emailed it, please post here the ticket number you received so I can locate your message in the system and get back to you over there. Thank you @Erik1P! I confirm that we have received your report, we will get back to you via email as soon as possible. @Erik1P - thanks for the follow-up, and glad to hear we were able to help you resolve the issue!